“It is definitely easier for an individual to give the best of oneself in an environment where one feels good”, one of Vitra’s mottos. The Vitra showroom during NeoCon2018, presented a space totally dedicated to the CYL line, a new creation by French designers Ronan and Erwan Bouroullec. for the brand. 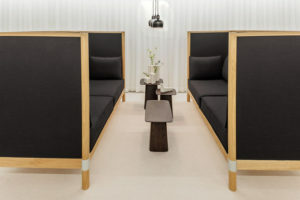 and aims to create places of tranquility and strength by refocusing on traditional values. Solid wood emphasizes the clean lines of the system with its smooth surfaces, structural frame and cylindrical elements. A rather unusual material in office environments, solid wood symbolizes craftsmanship and naturalness. The Cyl system includes a range of tables and a sofa with rear and side panels of different heights. 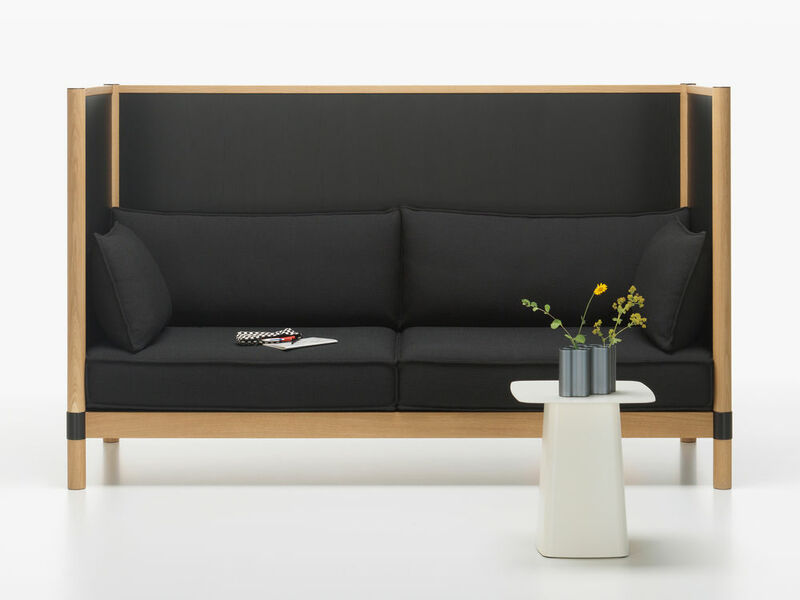 The side and rear panels of the Cyl Sofa create a small space to be isolated: if the low panels indicate that some intimacy is desired, the high panels actually form a protected physical space, the Cyl Sofa High offers a visual protection of the users. Two Cyl Sofa High can be placed facing each other to create a spontaneous meeting room, without the need for fixed structures. The firm upholstery of the sofa supports the right sitting position for work and meetings, the panels are available in wood veneer or with a fabric covering.